As some of you are aware we received a brief critique of the poster Jamie and I presented at the OAS symposium in September titled “A New Candidate for Cahiague” . This critique is from Prof. Conrad Heidenreich a well respect authority on Champlain who presented his view as to the location of Cahiague at our September chapter meeting. As to Dr. Heidenreich first comment – Our leagues were measured from the Narrows because on first reading of Champlain’s text “…and passed along the shore of a small lake, (Couchiching) distant from the said village (Cahiague) three leagues, where they make great catches of fish (the Narrows)….. –( See blog post dated Oct 4th 2010 for full text and reference.) it seemed clear to me that the distance referred to by Champlain was to that part of Lake Couchiching were they “make great catches of fish” known today as the Narrows at Orillia. As the Narrows is the only undisputed fixed point of reference we have it seem obvious that one would measure back from there in an effort to determine the vicinity in which to look for Champlain’s Cahiague. It is also obvious that Heidenreich has a different understanding of Champlain’s text and hence we suggested that alternative points of view might be sought regarding the interpretation of Champlain’s statement. Given Heidenreich’s critique of our process I will prepare a map with measurements taken from the Warminster site to the closest point of Lake Couchiching and review those results against the distance obtained both for a straight line and for the distance that may have been travelled over a less than straight trail. As to the second highlighted point above, I am not sure how the size of the Warminster site relates to its identification as the Cahiague of Champlain unless all sites between Warminster and Lake Couchiching or the Narrows were tested for size and dating. If this were done and Warminster was the only site that met this criteria then this would be a much stronger point than it appears to be now. To my knowledge few if any sites between Lake Couchiching and the Warminster/Ball site district have received any degree of through examination as to their size or date. The point of our poster was to draw attention to at least one more site that may be worthy of consideration and hence examined to this extent. Heidenreich goes on to say that the “clincher” to him was that Warminster was found to be a double village and that Cahiague has been translated to mean “it is cut in two”. I am not aware of any reference by Champlain as to the 1615 Cahiague being “cut in two”. Bruce Trigger raises this point in "Aataentsis" on page 304. 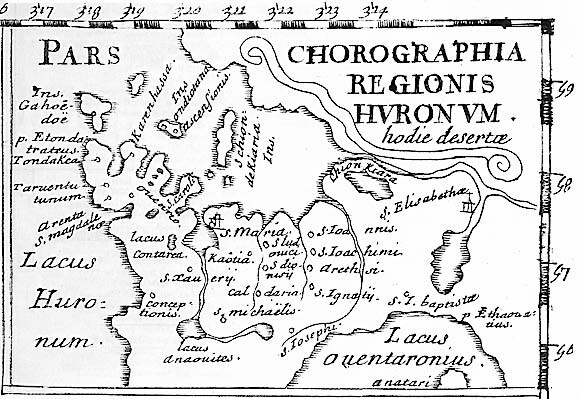 There is a reference in Sagard however to the Cahiague of 1623 being split in two but this is some 8 years after Champlain’s visit. Another concern that I have with this point is that I believe that this translation of Cahiague was supplied by John Steckley and when I read his text (Words of the Huron pg 142), he clearly states at the bottom of the paragraph where he gives his understanding of the meaning of Cahiague “…I am not absolutely sure that this is how the word should be translated.” I have asked another Wendat linguist to share his understanding of the meaning of the name Cahiague and will share this when it is made available. I for one welcome the critique of our poster by people like Professor Heidenreich and others for a poster presentation is like any other paper that may be presented for peer review. It is only through the dialog created by peer review that we can hope to refine our thinking when seeking after a better understanding of the truth. Sometime before the 400th anniversary of Champlain’s arrival in Huronia I would hope that we could have a roundtable discussion with all those involved in this field (amateur and professional alike) with an interest in the location of Cahiague and indeed the other Champlain villages of Huronia in an attempt to come to a conscientious as to their locations based on the best historical and archaeological data of today.